We woke up to a cloudy morning to find that the Schlüterhütte and everything around it was covered with snow. Not a lot, maybe an inch or few centimeters. Of course this was nothing out of the ordinary in the mountains but it being in the middle of our summer vacation, it was a little unexpected. We had a fairly ambitious plan for the day aiming to hike all the way to Passo Gardena with lunch at the Puezhütte. 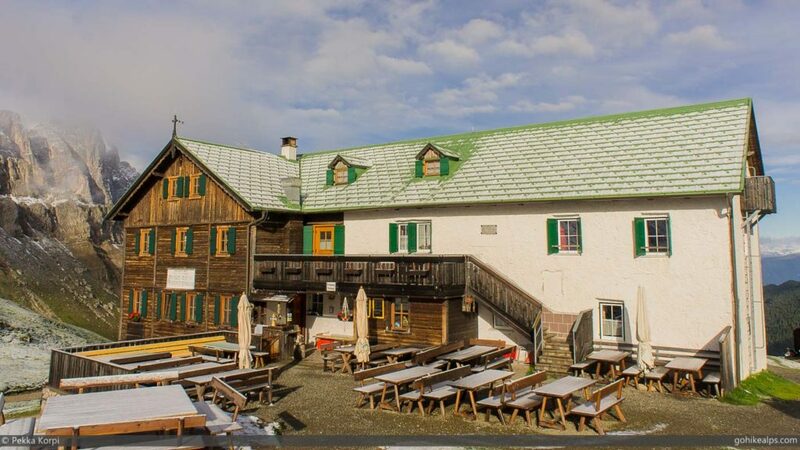 A lot of people would have opted to aim for Puezhütte and spend the night there. We, however, wanted to make up for some of the lost time due to our troubles in Venice and also, we wanted to spend our night at a “proper” hotel with guaranteed room privacy and a hot shower. Looking at our map, the route seemed clear enough: walking along a mountainside trail with a steep rise up to the Roa-Scharte. 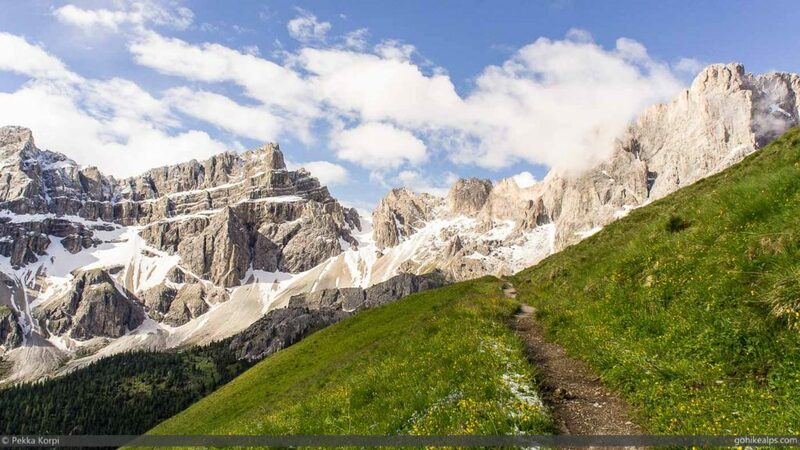 From there it would either be over Furcela Nives or a walk around it and then a leisurely walk to Puezhütte. From there on the trail seemed fairly no frills: walking across Altipiano de Crespeina to Forca de Crespeina and then making our way down to Passo Gardena. After breakfast and gathering our stuff, we started walking on a snowy trail. There was only about an inch so it was not problematic at all. The path was easy to follow and very visible ways ahead. A short hike up the hill and across the pass and we were looking at the wonderful views into Val Badia. After all the rain the day before, this was a joyous moment. The visibility was good enough to already see our first target, the Roa-Scharte pass. The path followed the mountainside just as we expected from our map. After a short walk and a leisurely descent we came upon Meidalgesalm. We had no reason to stop and were feeling energetic so we just passed it continued towards Roa-Scharte. The path continued on the mountainside and eventually started going upwards as Roa-Scharte started getting closer. We even ran into some wildlife, with what could have been a chamoix, ibex or deer traversing above us. Hard to say for sure since she was just too far away. If I had a longer lens on my camera, it might have been possible to get a nice photo! The closer we got to Roa-Scharte, the rougher the path became. The last part became much trickier then we had thought since it turned out the path was completely covered in snow. The final ascent to Roa-Scharte is a steep one and it’s on the north face of the mountain. It took a while for us to figure out that there really was no way other than to just do our best with the snow. With no sign of the path, we just carefully made our own. I didn’t feel there was any danger of an avalanche, but slipping and sliding would have been possible. Once on top, we took a well deserved break. When I had looked at the map, I had ambitions of taking sort of a short cut over Furcela Nives. According to the map there would have been some Via Ferrata and for sure awesome views. However, after the steep and snowy climb up to where we were, we didn’t feel a need for the extra challenge at this point. It would have been further up, it was covered in snow and we didn’t really know what was up there. We still have a long day ahead of us so we decided to take the longer but easier path to Furc de Sieles and approach the Puezhütte from there. According to the sign, this is the proper Alta Via 2 path anyway. The walk to Furc de Sieles was uneventful. We walked down to Roa-Tal a little bit and then followed the path back up to Furc de Sieles. Some beautiful views opened up to the west and we could see all the way to the ski area above St. Christina and Ortisei, with lifts going up to Seceda. We had been there on skis just the winter before and a weird sense of familiarity came upon us. I wouldn’t call it a warm fuzzy feeling but something nice anyway! Once up on Furc de Sieles, again a new world opened up – this time it’s the Vallunga valley and everything behind it. These moments when after the climb you see what’s on the other side are one of the reasons I love hiking in the mountains so much! We followed trail 3B on the mountain top until it joins up with the path coming down from Furcela Nives. From thereon it’s an easy descent to Puezhütte, with beautiful views along the way. 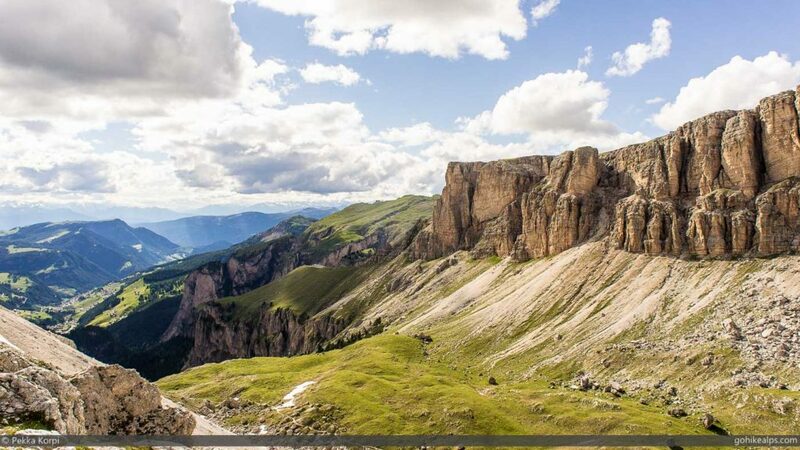 You can see down to Val Gardena and some of the ski area above the town of Sella Val Gardena, as well as the impressive Sassolungo mountain. If you follow alpine skiing, you might know this is home to the famous Saslong Classic – one of the five men’s “classic” downhill races. Puezhütte seemed a good place to stay overnight, and probably a lot of people on the Alta Via 2 do just that. We were determined to reach Passo Gardena, though, so after lunch and coffee we continued on the trail towards Altipiano de Crespeina. At around Forc. de Ciampei we had another nature experience when ran into a little lamb who was obviously lost from his herd. 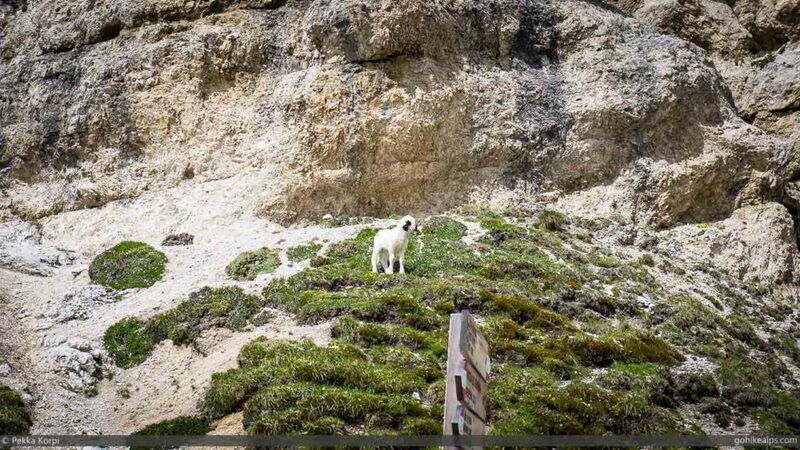 We could hear the others somewhere down below, but this little guy didn’t seem to be able to find her way down there and was just running around distressed. The trail across Altipiano de Crespeina was an easy one and the landscape was kind of “lunar”. It was different from the rest of the trip somehow. Just after Forc de Ciampei there would have been an option to take a higher trail (2A) up to Sas Ciampac but it had already been quite a long day so we chose not to take it. 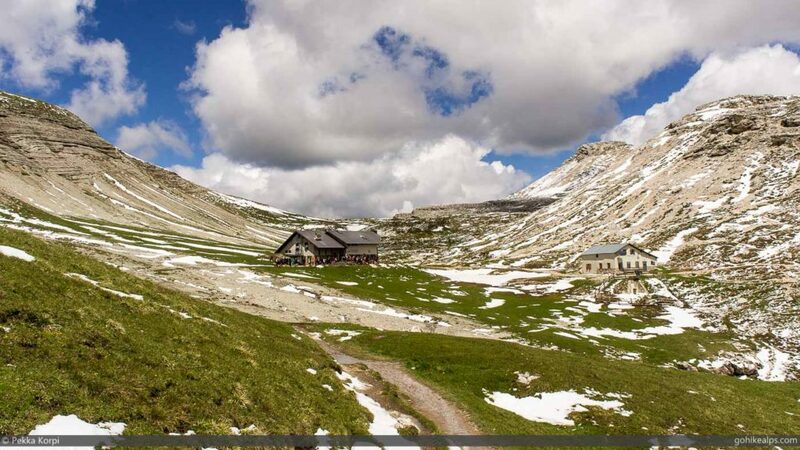 Had we spent the night at Puezhütte, I’m sure we would have taken it. After walking across the Altopiano de Crespeina and passing the lake, Lech de Crespeina, there’s a rather steep climb up to Forc de Crespeina. For us, this was a place to take a break and enjoy the views. We were getting pretty tired and talked warm heartedly about the excellent meal and cold beer we would have at Passo Gardena. Some way to go still, though, but mostly downhill. 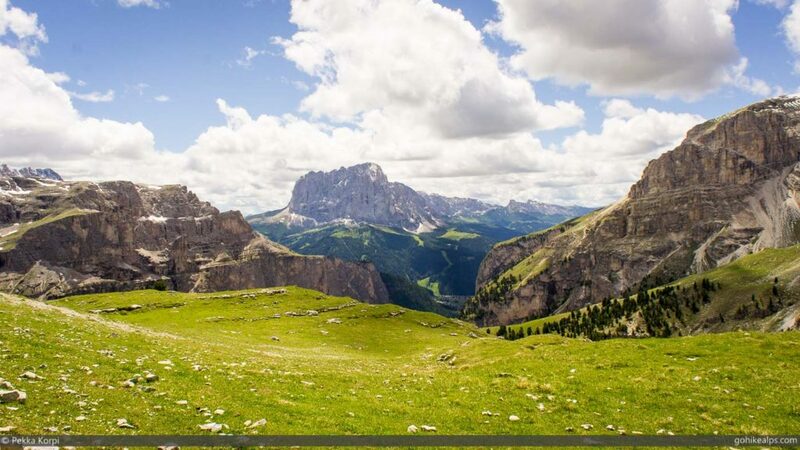 From Forc de Crespeina you can see far into Val Gardena and if you wanted to walk down to Selva Val Gardena for the night, you could do it easily from here just walking down Val de Chedul. If you wanted to or needed to make an earlier exit off Alta Via 2 for Selva, you could have gone down already from the Puezhütte, walking down the Vallunga Valley. The reason I mention this is that Selva is a proper town with all the possible conveniences you can imagine – including stores to stock up on any supplies or gear you might need. Naturally, there’s also very good transportation options. And, to get back on the Alta Via 2, you can take a ski lift up to Passo Gardena and save yourself a rather uninteresting uphill walk. We didn’t have a need to go to Selva so we made our way on the side of the valley and up to Cirjoch. There the trail goes into a very unique Dolomites mountaintop with very rugged terrain and needle-like stone structures. The path itself is just fine and not any more demanding, but the terrain was something else. 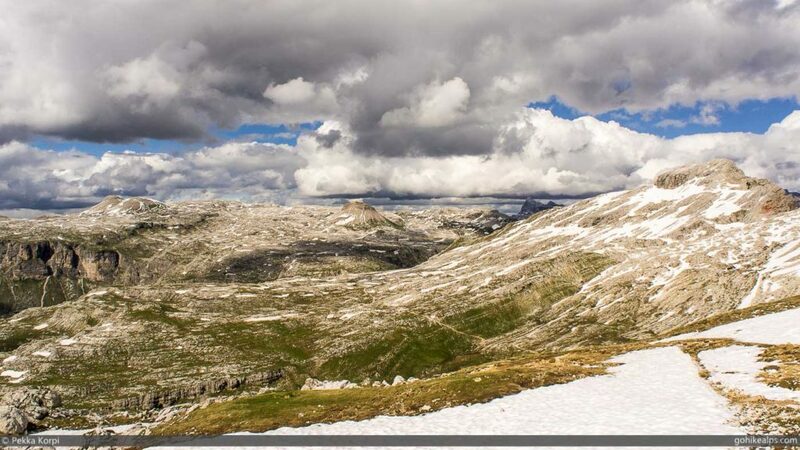 From here you also get to see the next day’s challenge in more detail, the Sella Group. 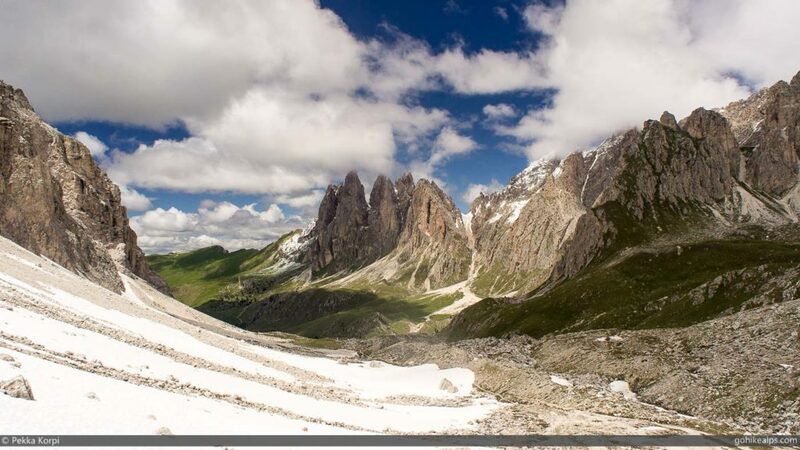 Once through all the needles, Passo Gardena suddenly opens up. 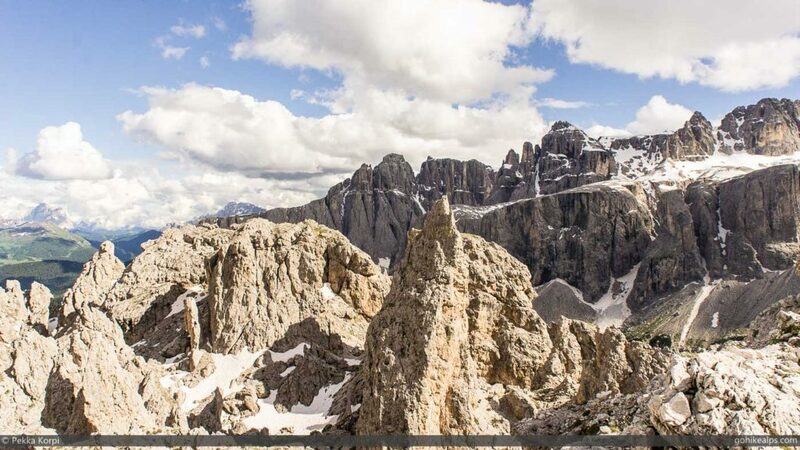 Passo Gardena is basically a ski area and the Puez-Geisler National Park ends here. 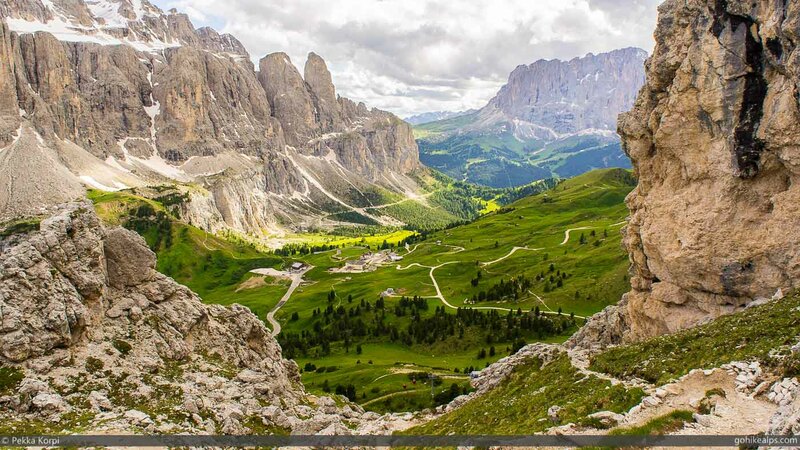 There’s also a relatively busy road linking Selva Val Gardena and Corvara in Badia. This being the case, there’s also a few comfortable hotels, with excellent meals, cold beer and hot showers. After our long day, all of these felt wonderful and we were happy to have met our target. A wonderful day. The weather treated us nicely – it was a little cloudy and not too hot. 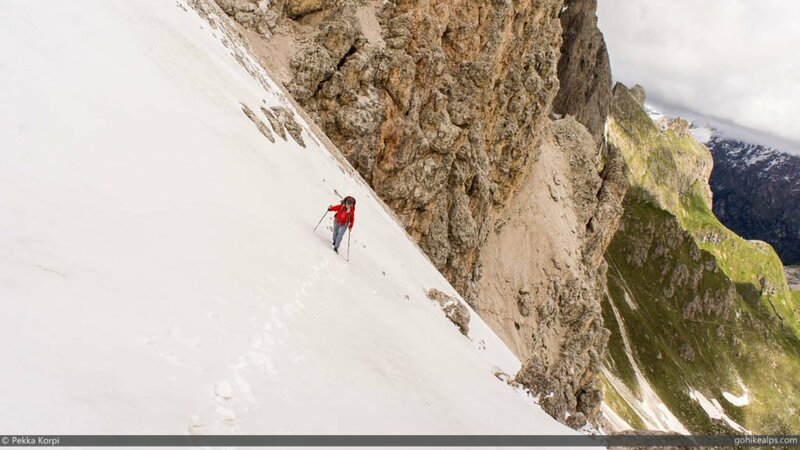 We had no difficulties apart from the snow on the north side of Roa-Scharte. It was a long walk for one day. 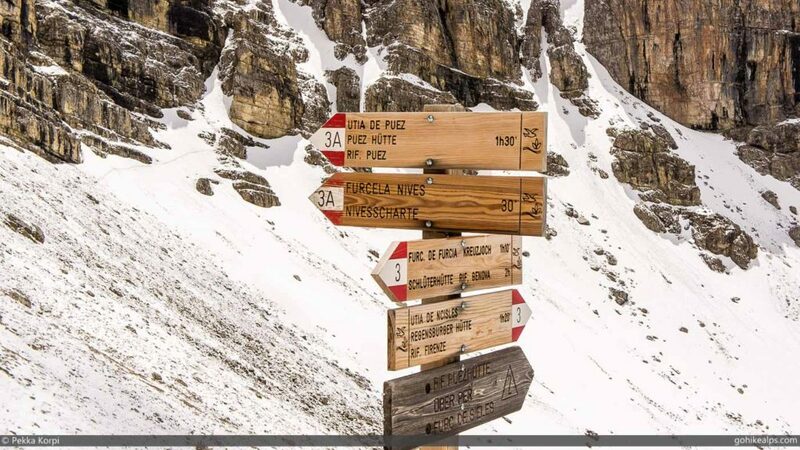 I can easily understand why people would choose to stay at the Puezhütte instead of continuing to Passo Gardena. However, if you’re reasonably fit and the weather is ok, we thought it was totally doable. 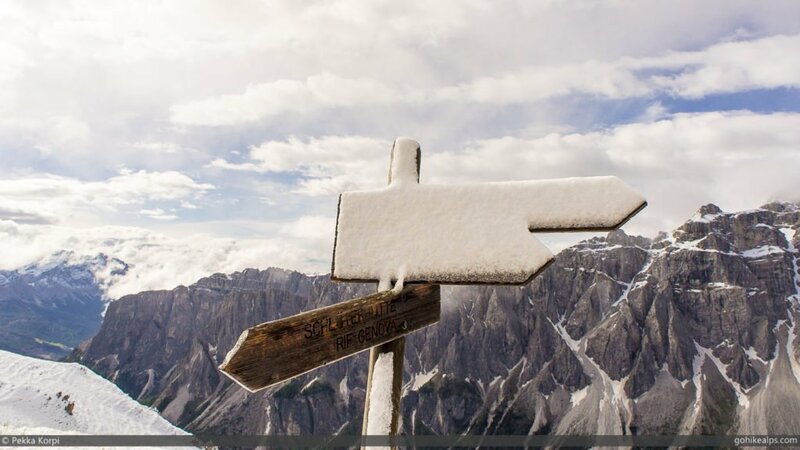 NextPasso Gardena to Passo Pordoi – Whiteout!